Find out about what happens when you have external radiotherapy to the brain for lung cancer. 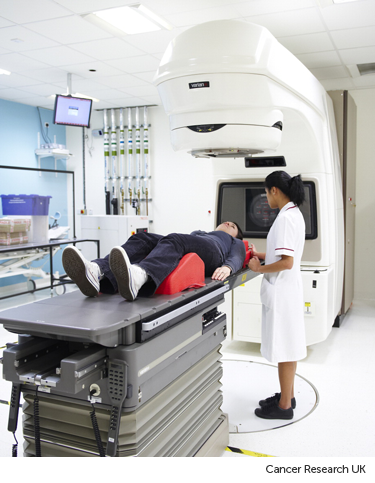 Radiotherapy means the use of radiation, usually x-rays, to treat cancer cells. For small cell lung cancer, doctors sometimes use radiotherapy to the brain to kill any cancer cells that might have spread into the brain but are too small to see. You usually have 5 to 10 treatments over one week. 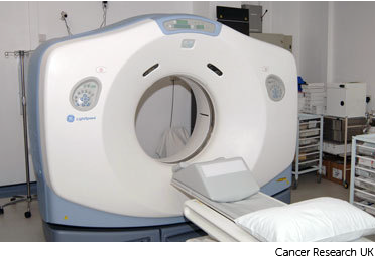 Before your radiotherapy you have a planning session and a planning CT scan. The planning session takes between 15 minutes and 2 hours. You also have a mask (shell) made that keeps your head very still. A radiographer or technician makes your mask in the radiotherapy department. They might call the mask a radiotherapy shell. The mask covers your face, and the top and sides of your head. It attaches to the couch when you are lying down for the planning scan or radiotherapy treatment. The process of making the mask can vary slightly between hospitals. It usually takes around 30 minutes. You need to wear clothes that you can easily take off from your neck and chest. You also need to take off any jewellery from that area. Facial hair, long hair or dreadlocks can make it difficult to mould the mask. The radiotherapy staff will tell you if you need to shave or tie your hair back. The technician uses a special kind of plastic that they heat in warm water. This makes it soft and pliable. They put the plastic on to your face so that it moulds exactly. It feels a little like a warm flannel and is a mesh with holes in so you can breathe. After a few minutes the mesh gets hard. The technician takes the mask off and it cools down. You might need to have one more fitting to make sure it is exactly right. You wear the mask for your planning CT scan. The radiotherapy staff keep the mask in the department for when you go back for treatment. You wear it for each treatment session. Voiceover: Making a mesh mask for radiotherapy takes a few minutes. Radiographer: I am just going to heat this up now if you just keep nice and still there and just want to close your eyes for us. Voiceover: The radiographer softens the mask by putting it in warm water for a minute or two. When the radiographer puts the mask on to your face it will feel warm and damp. They then clip it to the bed that you are lying on. It takes a minute or two to dry into the shape of your face. The radiographers will mark the mask where the light lines are. Radiographer: Okay, you are just going to feel us pressing down on the mask there; you are doing really well are you still okay? Voiceover: They use the marks on the mask to line up the machine each time you have treatment. 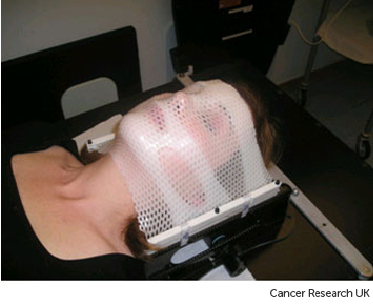 The mask keeps you head still and makes sure that your treatment is directed at the cancer. They put your name on the mask and keep it in the radiotherapy department ready for your treatment. Patient: They um told me about the procedure, a mask being fitted, uumm that it would be moulded to the shape of my face. Umm which they did, three lovely girls umm put my mind at ease, sat me down, heated the mask, moulded it around my face, um not an uncomfortable thing at all to go through. Radiotherapy machines are very big. They usually rotate around you to give your treatment. The machine does not touch you at any point. Before you start your course of treatment your radiographers explain what you'll see and hear. In some departments the treatment rooms have docks for you to plug in your music player. So you can listen to your own music. The radiographers help you to get into position on the radiotherapy table. If you need to wear a mask for your radiotherapy, the radiographers will position the mask over your face and attach it to the table. The mask keeps your head completely still while you have treatment. The room is darkened and the radiographers line you up in the radiotherapy machine using laser lights and the marks on the mask or your skin. You will hear them saying measurements to each other to get you in the right position. Then the radiographers leave you alone in the room for a few minutes. You need to lie very still. The machine makes whirring and beeping sounds. You can't feel the radiotherapy when you have the treatment. Your radiographers watch and listen to you on a CCTV screen in the next room. You can signal to them with your hand if you need to move or want the machine to stop. External radiotherapy does not make you radioactive. It's safe to be with other people throughout your course of treatment, including pregnant women and children. Tell the radiotherapy department staff if you prefer treatment at a particular time of day. They can try to arrange this. If you have no other way to get to the hospital, the radiotherapy staff might be able to arrange transport for you. But it might not always be at convenient times. Some hospitals have their own drivers or can arrange ambulances. Some charities offer hospital transport. Radiotherapy to the brain can cause side effects. Let your doctor, nurse or radiographer know about any side effects that you have. Then they can find ways to help you. Radiotherapy to the brain can make you feel very tired. The tiredness usually comes on gradually as you go through your treatment. By the end of the course of treatment you may feel very tired. The tiredness usually carries on for about 6 to 8 weeks and then starts to get better. In a few people, the tiredness can become very severe a few weeks after the end of treatment. You might also feel drowsy and irritable. This is a rare side effect and is called somnolence syndrome. It doesn't need treatment and gets better on its own over a few weeks. It is important to rest or sleep when you need to. But it is likely to help if you can get some regular exercise. A daily walk is good if you are able to do that. You might feel sick at times. You can have anti sickness medicines. Let your treatment team know if you still feel sick, as they can give you another type. Your skin will always be more sensitive to the sun after treatment. If you have no hair, remember to keep your head covered or wear a hat if you go outside. Or you need to wear a complete sun block.